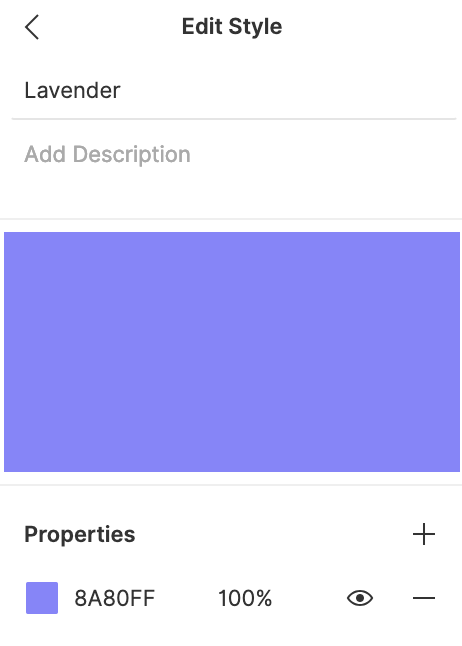 The Styles feature allows you to define a set of properties or attributes of an object, that can be reused across your team's designs. View a list of your Local Styles. 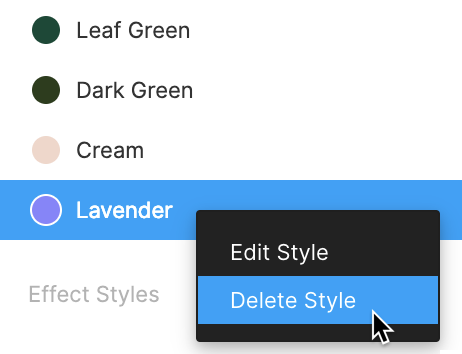 View, Edit and Delete individual Styles. 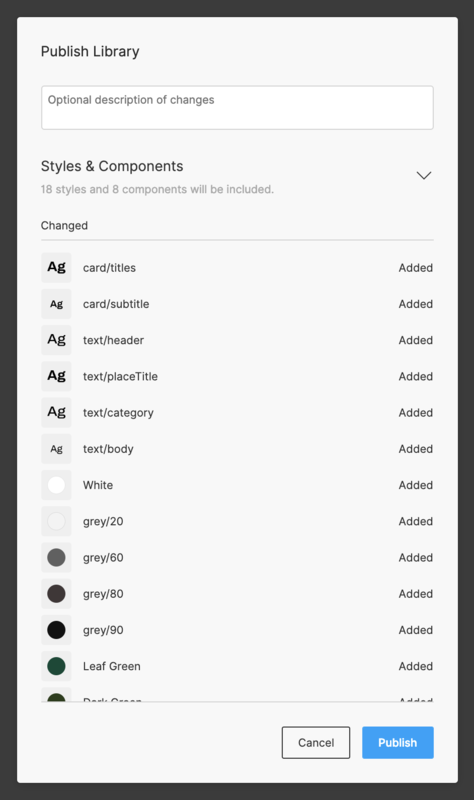 Share Styles | Publish Styles to your Team Library. Once you have created at least one Style within a file, you will be able to see a list of Local Styles in the Properties Panel on the right, if you have nothing selected. 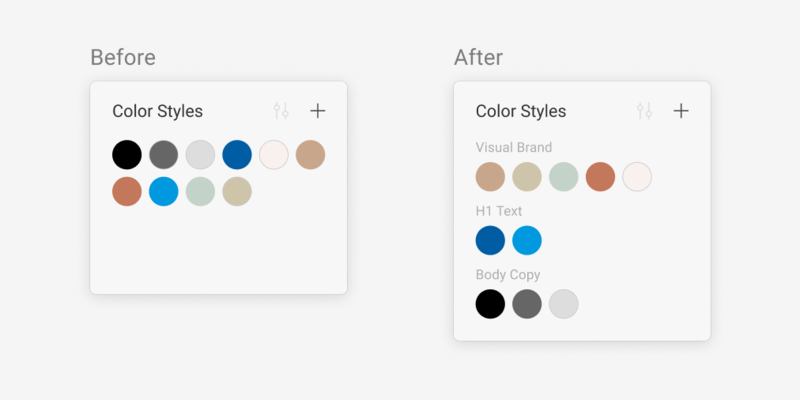 Styles will be grouped by the Style type ( Color, Typography, Effects, and Layout Grids) and will appear in the order they were added. 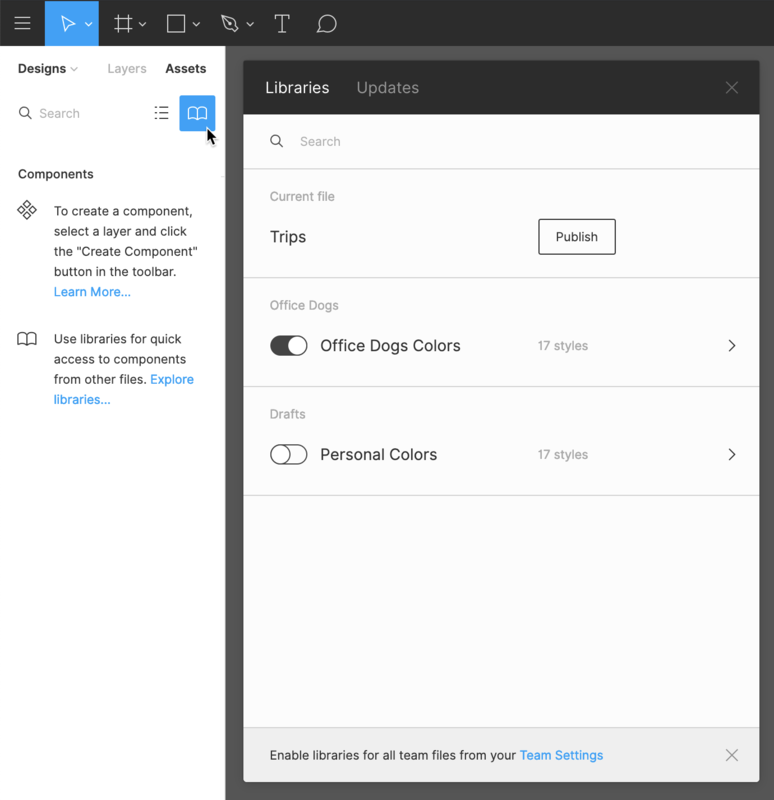 If you are working with multiple Team Libraries, you will see all of your Local Styles and Shared Styles in the Styles menu. Styles will be ordered alphabetically by team name, then file name. You can also view or make any changes to Styles, directly from the Styles panel. Make any changes to the properties listed. Click on the eye icon to hide or show the property on any objects the Style is applied to. Click the "-" to remove the property from the Style. Tip! Any changes you make to the Style here will update any objects in the file that have this Style applied. If you would like to remove a Style, you can do this directly from the panel. Right-Click on the Style in the list. 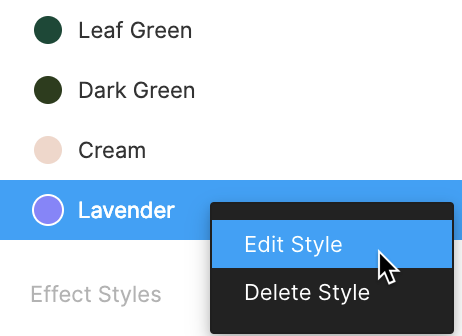 To make finding and selecting styles easier, you can organize your styles into groups by naming them with a slash naming convention. Tip! 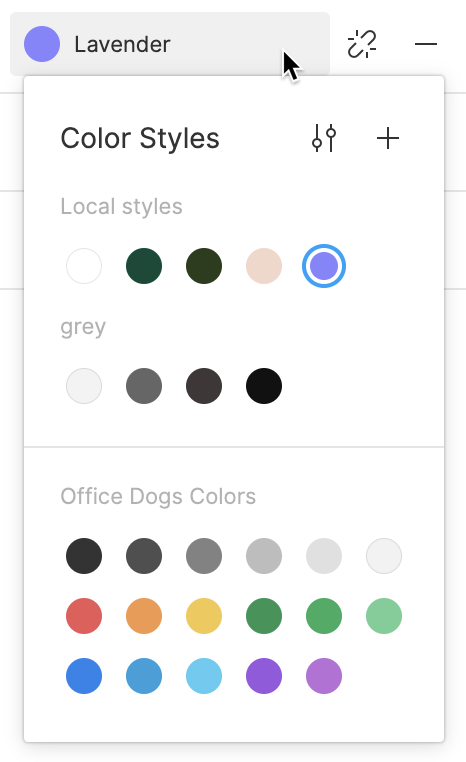 Your Styles will appear in the Styles Panel in the order they appear in the Local Styles list. 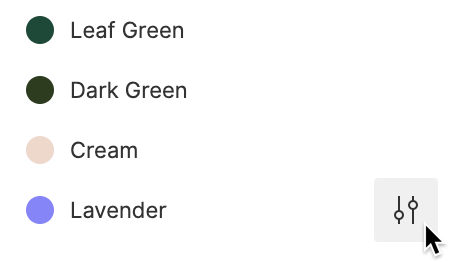 To change the order your Styles appear, you can update them there! 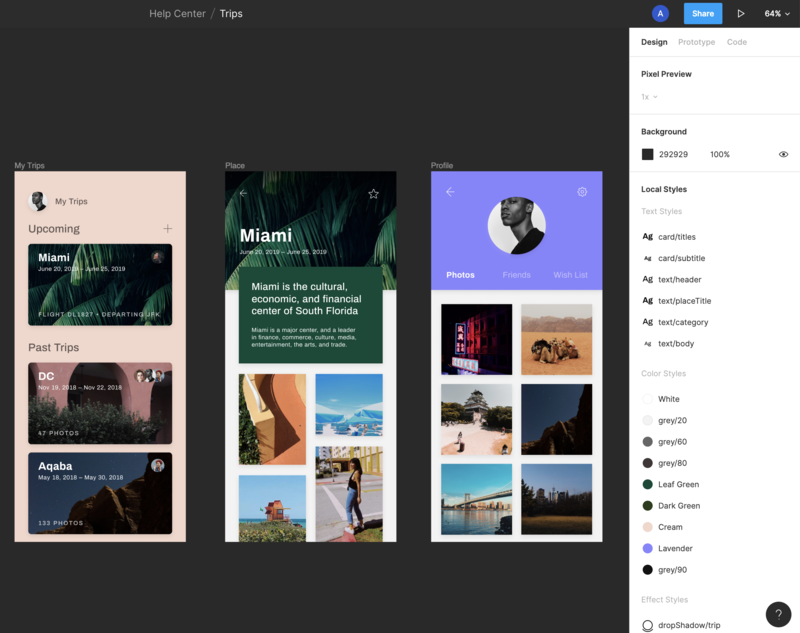 To share Styles with your team or make them accessible from other files and projects, you can publish them to your Team Library. 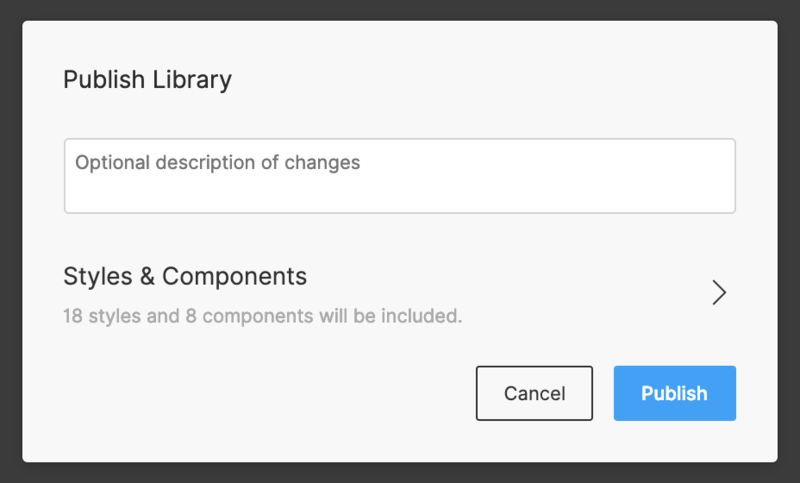 Styles are published along with any Components when you publish a file to the Team Library. Tip! Publishing Styles is included in our Starter Teams plan for free. However, you will need to be on one of paid Professional Team Plans to be able to publish Components to a Team Library. Learn more in our Team Library article. Click Publish Changes to publish them to your Team Library. When you enable a Library for a file, all editors in that file (that have permission) will have access to those Styles and Components. When you Publish any changes to the Team Library, you will be prompted to update the Team Library in any other files that use these Styles. This ensures any objects that use these Styles remain up to date.